The UNESCO International Jazz Day 2016 is here again. UNESCO INTERNATIONAL JAZZ DAY are the moments we live to re-live, the memories we share with loved ones and the soundtrack we choose to enjoy during these times. That soundtrack is music that holds everything together. The unifying and uplifting spirit of jazz mixed with art, business and culture is certain to create an exhilarating and magical experience that day at Oriental Hotel, Victoria Island, Lagos. The event will see an impressive lineup of international artists such as Grammy Award-winning Norman Brown, Rick Braun, Carlo Rossi & The Organic Jam and Jon Scott. Some of Nigeria’s foremost Jazz artists will also be performing including Femi Leye, Sax Tee, Imoleayo Balogun, Phebean and Godwin Strings. 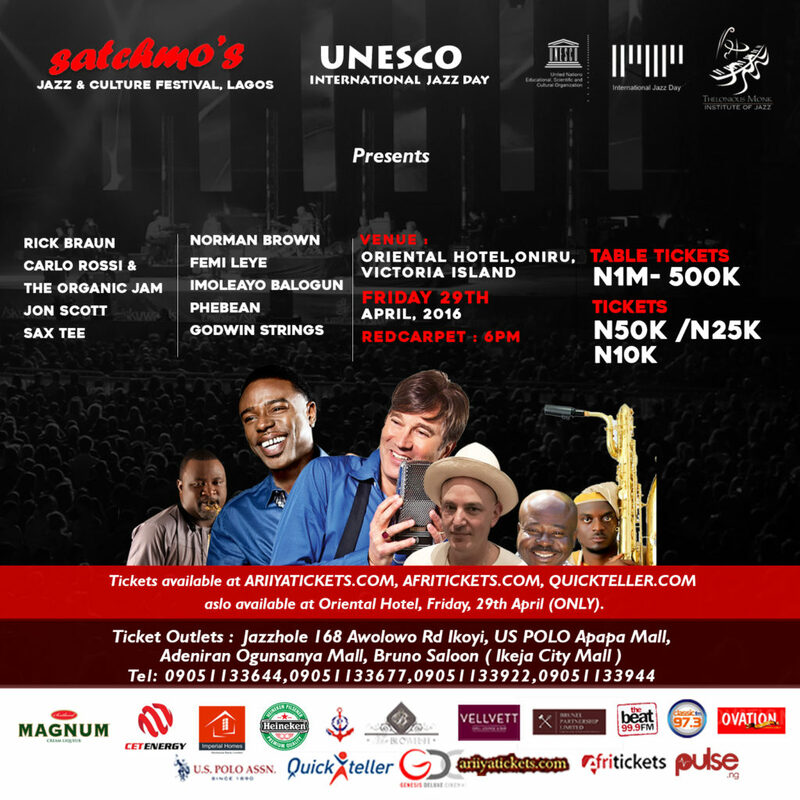 Once again, it will do just that on the 29th of April, 2016 during UNESCO International Jazz Day (IJD), an event that would be the highlight of Satchmo’s Jazz and Culture Festival which will be on for five days. The UNESCO International Jazz Day 2016 event will be more exciting than words can explain and more enjoyable than every event you have been to this year! Having choices is good, making a great choice is better. Choosing to attend this event means you will be joining us to create moments that would never be forgotten. Be there or be there!